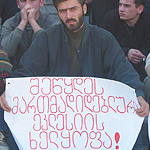 The sign reads ""Stop Infringing Orthodoxy"
The Georgian government has yielded to pressure from the Georgian Orthodox Church and delayed signing of the inter-state treaty with the Vatican. Along with the international embarrassment, the power of the Orthodox Church’s isolationist lobby was revealed once again. President Eduard Shevardnadze made a last minute decision not to sign an agreement with the Vatican after the mass protest rally took place on September 19, backed by the Georgian Orthodox Church. An agreement, along other inter-state issues, would have guaranteed religious freedom and legal rights for the Catholics in Georgia. "Development of the draft agreement started in Georgia long ago, immediately after the visit of Jean Paul II, the Pope of Rome, to Tbilisi [in 1999]. The agreement aimed to settle the cooperation between the two states. I am of Orthodox faith, but I honor all other religions," Shevardnadze said in his Monday radio broadcast on September 22. He said the work over the draft would continue. The President also said that simultaneously, the Parliament would continue its work on the draft Law on Religion. Observers note that the change of heart towards the agreement was caused by Georgian government’s unwillingness to risk losing support of the influential Orthodox Church on the eve of the parliamentary elections on November 2. Archbishop Msgr. Jean-Louis Tauran, Secretary for the Holy See's Relations with Foreign States, who arrived to Tbilisi on 18 September, was forced to leave empty-handedly on September 21. The Georgian Orthodox Church used all of its political muscle to prevent the agreement from being signed. Firstly, it acted as a public whistleblower, issuing a statement before the arrival of the Vatican’s Foreign Minister, the Georgian government intends to sign a secret document with the Vatican aimed, the Orthodox Church claimed, at increasing the Vatican’s influence in Georgia. “We do not know the details of this document. We signed a Concordat with the Georgian state [in 2002] and people knew the details of that document; it was publicly discussed. This agreement [with the Vatican] will cause serious problems for the Georgian government,” the Patriarch said. “While there is freedom of faith and religion in Georgia, our Constitution grants priority to the Georgian Orthodox Church and this is enforced by the Concordat signed between the Georgian state and the Church,” Bishop Zenon added. Last October, President Shevardnadze and the Patriarch of the Georgian Orthodox Church, Ilya II, signed a Concordat which gives the Orthodox Church important privileges over other religious groups. The Orthodox Church fears that the agreement with the Vatican would have threatened its exclusive rights in Georgia.